Putting away her things didn't work every time, though, so those items were tossed under the couch in a "If I can't play with them, no one can" last ditch effort. I had an urge... A craving, one might say, to be crafty tonight. It doesn't happen often, so when I feel compelled, I try to go with it. Tonight, I decided to make new, fun, pretty crayons out of old crayons. I saw a pin on Pinterest where someone made Valentines by sticking a home made crayon on a piece of paper and writing something cheesy like "Valentine, you color my world." I, of course, thought this was genius, even if it were a little cheese ball. 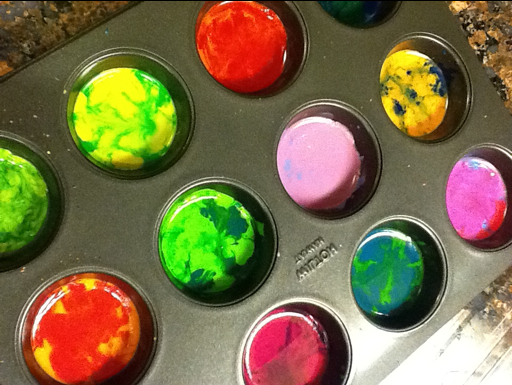 I had a great time crushing up crayons while watching Fringe with Drew an melting them in my oven. Had I titled this entry "Three things I learned today," number 3 would be that using your oven for something other than food is really fun!